This "periodic table" of trash is a pseudo-scientific satire of Gotham's refuse. Like the scent of the subway and hustling Times Square Elmos, garbage is an everyday element in the Big Apple—so why not embrace it? 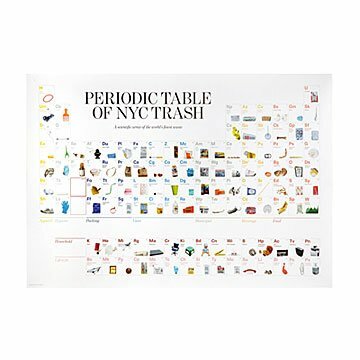 This "periodic table" of trash by native New Yorkers Molly Young and Teddy Blanks is a pseudo-scientific satire of Gotham's refuse and the disposable cultural record it represents. Organized into nine groups of naturally occurring (and accumulating) elements from broken umbrellas to bagel nubs, it's part revolting, part revelatory, and an authentic document of the New York experience. Oscar the Grouch would be proud. Photographed, designed, and printed in New York. Molly Young and Teddy Blanks collaborate on cool infographics and you might say that Molly provides the info, and Teddy provides the graphics. Molly is a writer for the New York Times Magazine and many other publications. With Teddy, she's the co-creator of the iOs sticker pack "Rejoinders,” which was named one of the Best New Apps by the Wall Street Journal. Teddy is a co-founder of a Brooklyn-based graphic design studio, where he creates book covers, movie posters, and title sequences for film and TV. He is also a singer and songwriter and composed the film score for Lena Dunham's Tiny Furniture. Native New Yorkers understand how funny the trash in our big city can be. This print brought back a lot of memories of growing up in Queens. I'm happy to have a little memento hanging in my home, so many miles away, that make me feel like I'm on tromping around the streets of NY again.